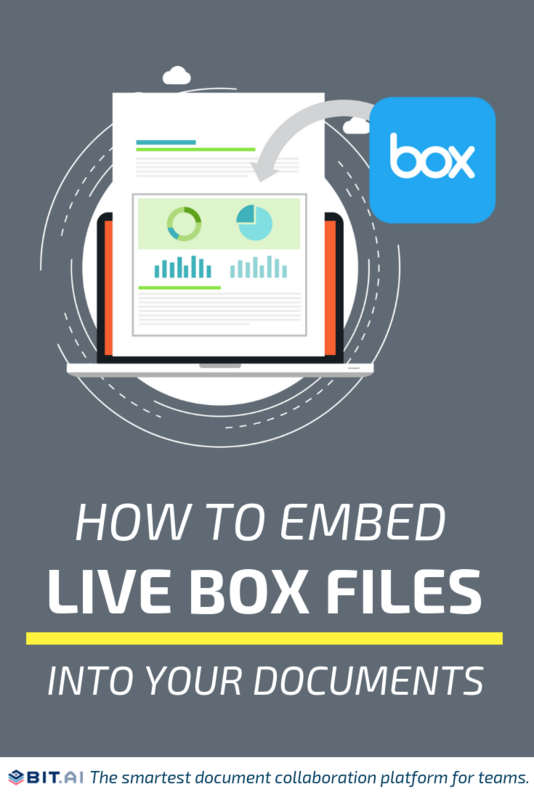 Learn how to embed live Box files inside a document as an iframe! The internet has made it extremely easy for anyone and everyone to share cloud-based files. Whether you work for a company, a freelancer or just want to share cat GIFs with friends and family, file sharing is something everyone’s familiar with. A recent Cloud Adoption & Risk Report found that the average employee uses three file-sharing apps at work! (Source: Skyhighnetworks.com). One of the leading players in the cloud storage and file sharing market is Box. A large number of 3rd party integrations like Slack, PowerPoint, etc. Embed live box files in your Bit documents as an iframe! If you are an avid user of Box you are going to love this trick! But if you are new here, let me just give you an introduction about Bit! Bit documents are new age workplace documents that are designed to be dynamic and interactive. 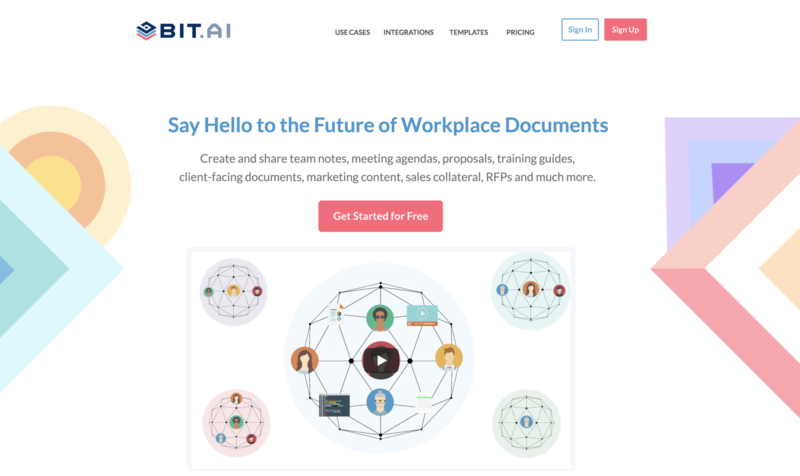 Bit allows teams to create workplace documents like- project proposals, sales decks, training documents, how-to guides, company policies, process documentation, media kits, fact sheets, competitive research, case studies, e-books, etc. If you want to send these documents to external partners, clients, customers or prospects, you can track them to get intelligent engagement insights. Apart from allowing multiple users to collaborate on documents, Bit also allows users to share any sort of rich media like YouTube videos, SoundCloud Playlists, embed Google Sheets, Docs, and Slides, Box files, One Drive Excel Spreadsheets, GIFs, Tweets, Cloud files, Pinterest boards, etc. Basically, anything on the internet with a link (i.e. www.example.com) can be shared and Bit will automatically turn it into visual content. Just enter any web link on a blank line and hit enter. Bam! The content will show up beautifully. When a Box file is added to a Bit document it actually appears in its entirety. It doesn’t matter if it’s a PowerPoint, Excel Spreadsheet, Word document, PDF or image. The content will show up inside of a Bit document! Any changes that you make on that file will be reflected in real-time inside of a Bit document. But why embed live Box files in a Bit document in the first place? We often share our cloud files with our peers over email. Then we try to explain what the file is about in the following emails, and before you know it you’re drowning in a sea of questions and answers! When you have your important content scattered around different devices and tools, your productivity always take the backseat. It becomes all too easy to get lost in a sea of browser tabs, and shatter that workflow! Browsing through hundreds of folders, searching in your disorganized and massively populated inbox, searching through your cloud files, etc., all end up being a search mission that’s impossible to crack. Sometimes you want more than just an email to explain what a particular file is about. You need context, information, and text to make your peers and teammates understand what the Box file that you just shared is all about and what they are supposed to do with it. 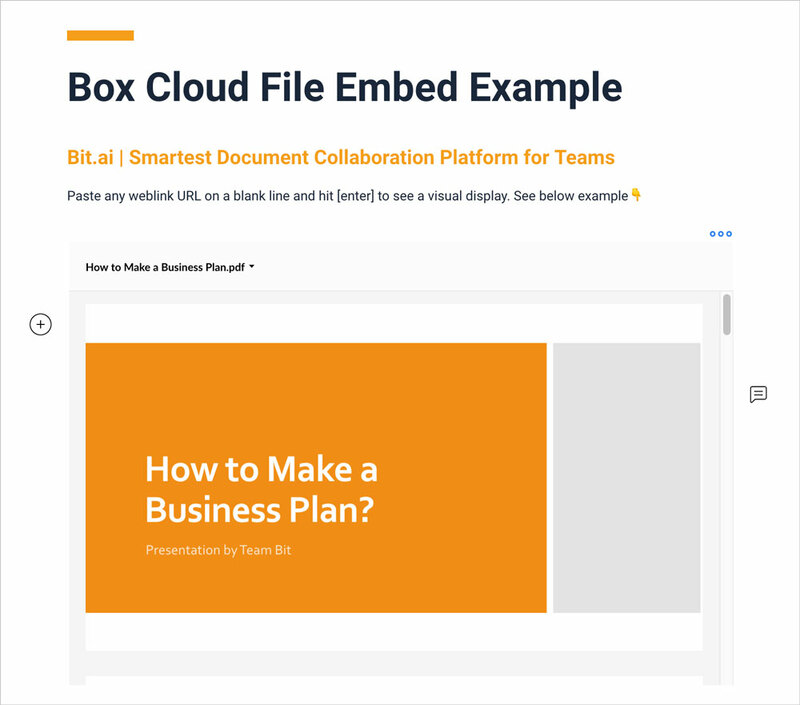 Embedding a live Box file inside a Bit document provides you with a much-needed space to discuss, give suggestions and feedback, and collaborate effectively- without people being lost and feeling confused. You’re also able to put various types of digital content together to tell a story and get an important message across all while you Box files are viewable inside of a Bit document. In order to carry out your effective collaboration and communication, you need to get rid of all the apps that seem to slow you down rather than make things better. You need to bring all of your cloud files, data, content, and most importantly, people, under a single virtual roof. Now all your documents, spreadsheets, marketing, and sales collateral, internal wikis, and knowledge and co-exist in one platform. 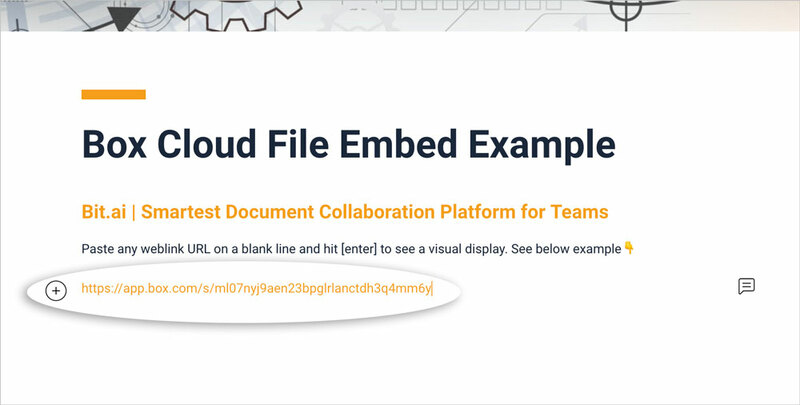 With Bit, you can copy and paste any Box Cloud weblink on a blank line of a Bit document and hit enter. No more dealing with messy iFrame/embed code! 1. 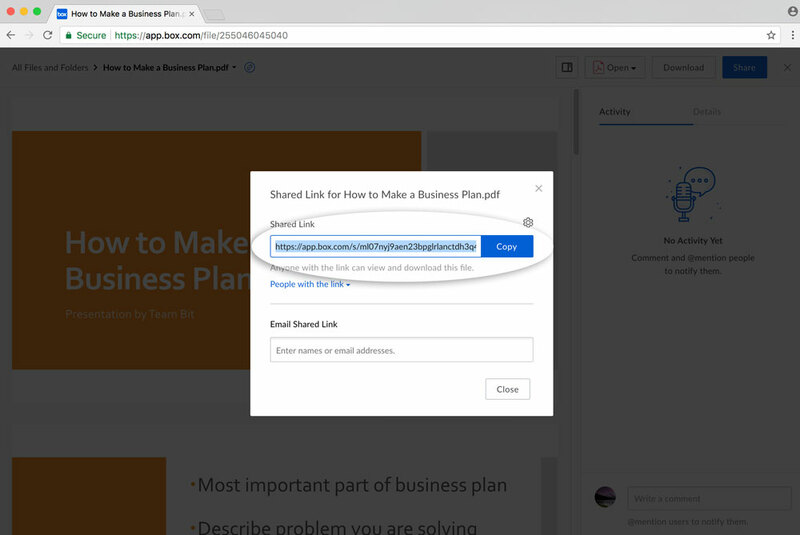 Click the share button for your Box Cloud File weblink. 3. Paste the Box Cloud File shareable link to a blank line in Bit. 4. With your cursor at the end of the link just hit enter and the Box Cloud File will automatically fetch. Important: Any changes made to this document in Box will be reflected in this Bit document rich embed in real-time. Bit provides a common workplace for knowledge workers and executives to collaborate with employees, share their knowledge, brainstorm ideas, store digital assets, and innovate together. The best part is that this knowledge is safely secured in your workspaces and can be shared (or kept private) with anyone in your organization! With Bit’s latest integration with Box, you can easily embed any live Box file inside your Bit documents as an iframe and reduce the friction that comes with having multiple work apps and tools. So what are you waiting for? Go try and embed live Box files inside your Bit documents and work seamlessly!